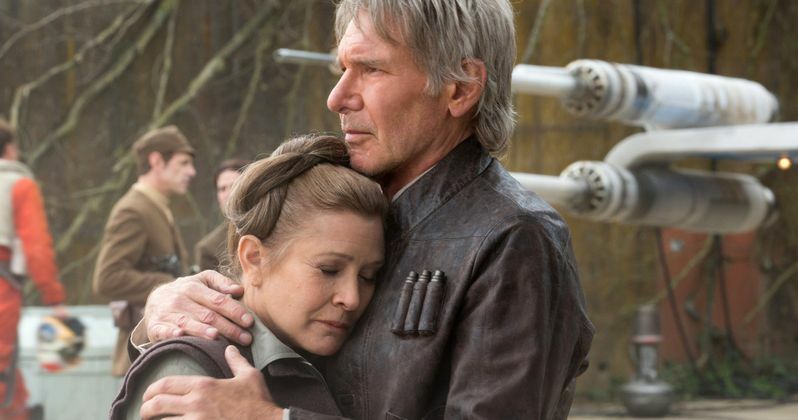 After a number of Star Wars stars responded to the news that Carrie Fisher had been rushed to the hospital following a heart attack, her leading man Harrison Ford reached out to publicly wish his former co-star well as she continues to recover. He sent a response to The Hollywood Reporter this morning. "I'm shocked and saddened to hear the news about my dear friend. Our thoughts are with Carrie, her family and friends." The world was rocked slightly off its course yesterday when news spread that Star Wars icon and acting legend Carrie Fisher had suffered a massive heart attack while on a flight from England into Los Angeles. Reportedly discovered not breathing during the flight just fifteen minutes before it was to land, many feared that Fisher might not make it. She was quickly taken from the airplane and rushed to the hospital, where she was announced to be in critical condition. Carrie Fisher remains at the UCLA Medical Center today. Her brother Todd Fisher told the Associated press late yesterday that Carrie, perhaps best known as Princess Leia in the first 7 Star Wars movies, had been moved out of the emergency room and was recovering in the intensive care unit. At this time, no further updated have been made. Todd Fisher told the press that Carrie was receiving 'excellent care' but he did not state her condition. At this time she is said to still be stable. As we head into the holidays, it is reported that Fisher's staff has not responded to requests for comment on the situation. Fisher is believed to have been traveling with her assistant and her dog Gary Fisher, who is safe and reportedly made it to the hospital as well. Over the past few years, the lovable pooch has gained his own cult of Star Wars fans, many who were worried about his wellbeing as well as his owner's. Following the news of her heart attack, a number of tweets came flooding in from Star Wars luminaries and others in the entertainment community, sending their best wishes to Carrie Fisher. There were two other actors on board, Anna Ankara and Brad Gage, who sent out a few tweets themselves, revealing they were sitting directly behind Carrie Fisher when she went into cardiac arrest, and that she stopped breathing during the flight. Carrie Fisher had been in London on a book tour for her latest autobiography The Princess Diarist. She had made quite a few headlines as she divulged the fact that her and Harrison Ford, aka Han Solo, had a brief but intense love affair way back in 1976 on the set of the original Star Wars. It was a much talked about topic of discussion as Fisher launched her book. As you can see, there is certainly no love lost between Harrison Ford and Carrie Fisher, who have remained close friends over the years. Ford reportedly gave Fisher permission to disclose their romance in the book. Here are a number of other tweets from those in the Star Wars family, including third wheel Mark Hamill and a few more celebrities as well.